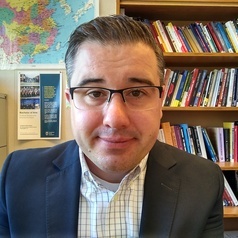 Robert J. Hanlon is a political scientist and consultant whose research explores the links between corporate social responsibility and human security in emerging Asian economies. He is an Assistant Professor at Thompson Rivers University and an associate faculty member in the School of Humanitarian Studies at Royal Roads University. Prior to joining TRU, Dr. Hanlon served as a postdoctoral research fellow at the Institute of Asian Research, University of British Columbia. He has taught at the University of British Columbia, Kwantlen Polytechnic University, Simon Fraser University and the Royal Military College of Canada. Outside academia, Dr. Hanlon has worked for the Asian Human Rights Commission, the Canadian Chamber of Commerce in Hong Kong, as well as the High Commission of Canada in Australia. He holds a PhD in International Relations and Asian Politics from City University of Hong Kong, a master’s degree in Peace and Conflict Resolution from the University of Queensland, as well as a BA in Political Science and Philosophy from the University of Victoria. He has been a visiting scholar at the Centre for Socio-Legal Studies (Oxford), the Kadoorie Institute (University of Hong Kong), the Liu Institute for Global Issues (UBC), the Sasin Graduate Institute of Business Administration (Chulalongkorn), and the Balsillie School of International Affairs in Waterloo, Canada.